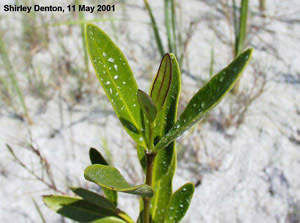 Ecological Restoration Notes: A keystone species of tidal swamps, especially in areas of higher salinity. 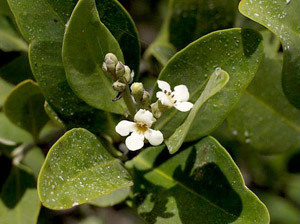 Description: Medium to large tree or a shrub with a dense rounded crown. Trunks stout, variable, often branching low to the ground but sometimes erect; to 1 foot in diameter or rarely larger. 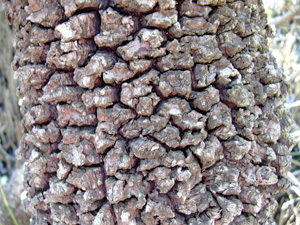 Bark dark, smooth when young, becoming rough with age exposing orange inner bark. Leaves leathery, dark and shiny above and lighter below, 1-3 inches long. Numerous, erect root projections (pneumatophores) emerge from the soil surrounding the tree. 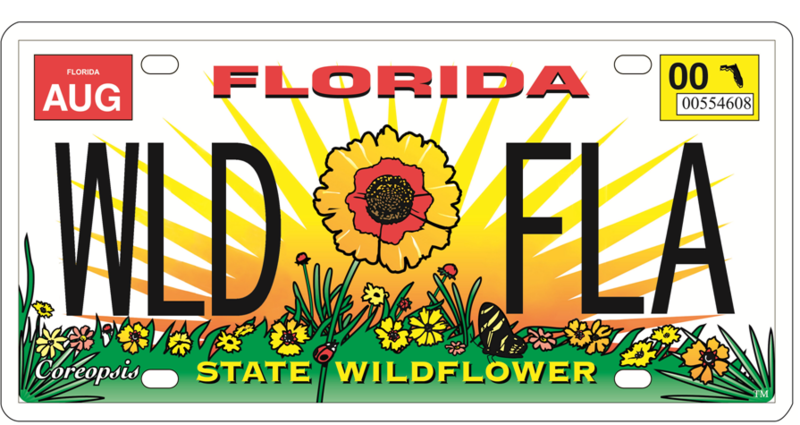 Dimensions: Typically 20-40 feet in height; to 61 feet in South Florida. 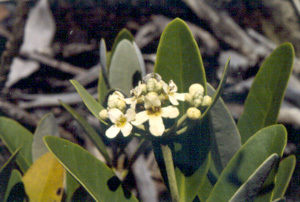 Usually taller than broad, but smaller, more shrub-like plants can be broader than tall. Range: Monroe County Keys north along both coasts to St. Johns County and Franklin County and west to Mississippi, Louisiana and Texas; West Indies, Mexico, Central America, South America and western Africa. 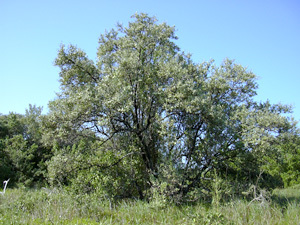 Common within most of its range. For a digitized image of Elbert Little's Florida range map, visit the Exploring Florida website. 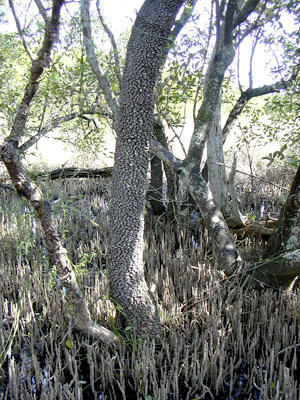 Habitats: Tidal swamps and marshes; also wet swales on beaches. 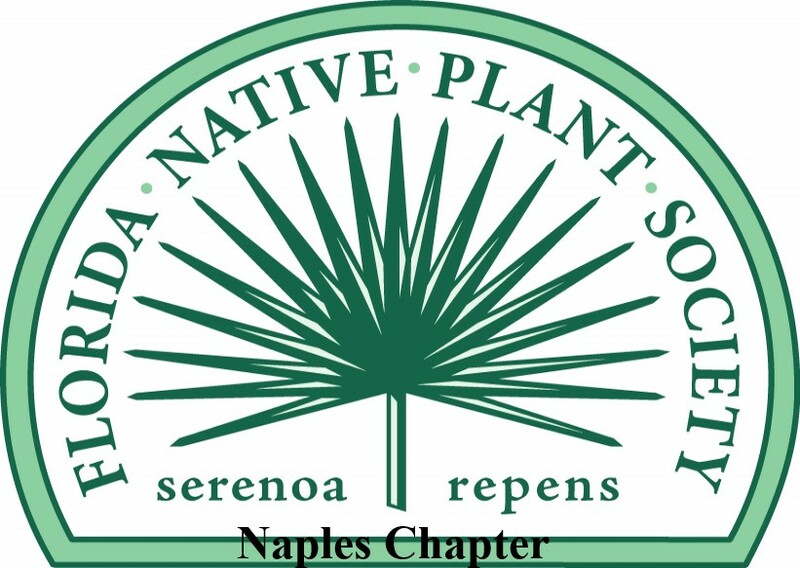 Soils: Wet, inundated saline soils. 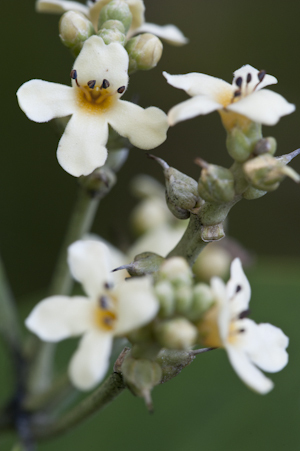 Flower Characteristics: Semi-showy, in cone-shaped heads, 1-2 inches broad. Fragrant. Flowering Season: All year; peak in spring and early summer. 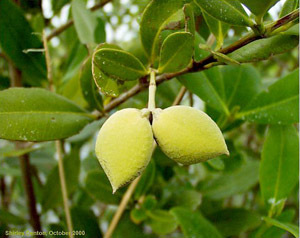 Fruit: Flatish, asymetrical, velvety green pod, 1-2" long; often beginning to germinate while still on the tree. 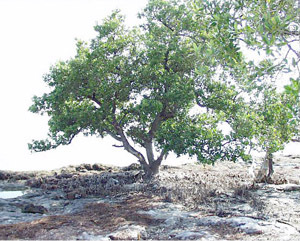 Wildlife and Ecology: One of three native mangrove trees, it is the most salt tolerant. 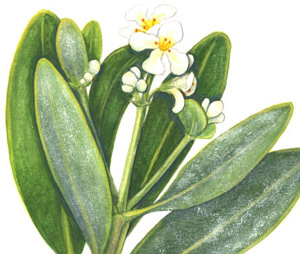 It exudes salt from the underside of the leaves. The pneumatophores provide air and trap tidal debris. 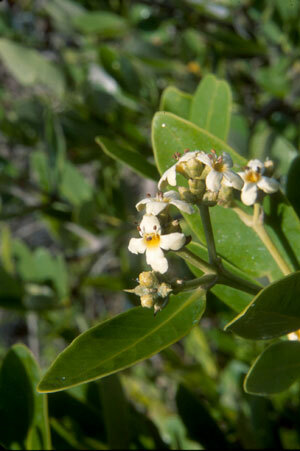 Larval host plant for mangrove buckeye (Junonia evarete) butterflies. 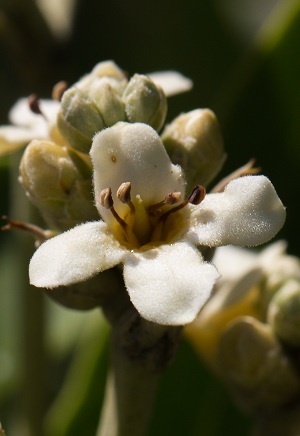 Nectar plant for great southern white (Ascia monuste) butterflies. Flowers also attract bees, which make honey from the nectar. Comments: The dense wood has been used to make charcoal. The honey is commercially harvested and is considered of excellent quality.